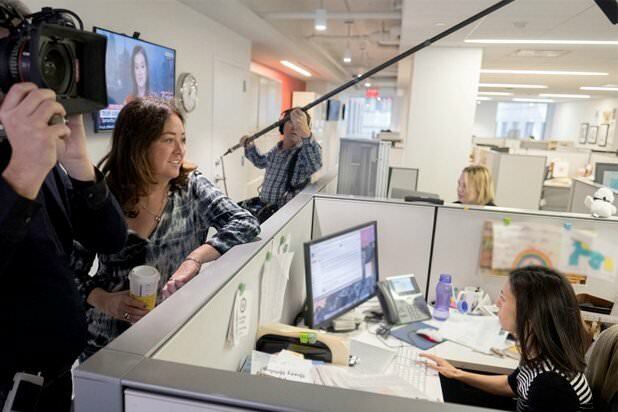 Liz Garbus shooting "The Fourth Estate" at The New York Times. Image courtesy Showtime. The last time we've had an intimate look inside the New York Times newsroom was the 2011 documentary “Page One: Inside the New York Times” by documentarian Andrew Rossi. It premiered at the Tribeca Film Festival. Given the changes in our media and our politics, I was sure it was going to be important. I wasn't disappointed. Garbus' first day shooting inside the Times newsroom was Donald Trump's inauguration day. You get to see the faces of the Times editorial team as Trump darkly intones: "This American carnage stops right here and stops right now,” and then ticks off a litany of problems including poverty, crime, and “rusted-out factories scattered like tombstones across the landscape of our nation." With Times Executive Editor Dean Baquet leading the group, there is a collective sigh as the reporters around the room try to take in the combative tone of what is traditionally a speech that brings the country together after a hard-fought political season. "What a story," says Baquet to no one in particular. The reporters in the film include Michael S. Schmidt, Matt Apuzzo, Adam Goldman, Mark Mazzetti, Glenn Thrush, Maggie Haberman and Washington Bureau Chief Elisabeth Bumiller. The basics rules of journalism are still very much in place. There’s a driven group of reporters who want to get the story right, break news, and fight a ticking clock and some strong competitors. That's as it should be. But in the years since Rossi and his cameras were on the Times, the speed of journalism has changed from a “page one" meeting that seems in hindsight genteel to a brutally hungry Twitter feed — and an audience expecting almost instantaneous analysis, reported in real time. Reporter's jobs are changing in the digital era, as Garbus told The Hollywood Reporter, noting that Baquet said: "When he was coming up in the newsroom, there was no expectation that you would talk about what happened today until it was in tomorrow's newspapers. But now readers want to know what's happening as it's happening, and that places enormous burdens on reporters and editors." “Reporters like Maggie Haberman and Michael Schmidt are out there doing television. It's part of their jobs and an extension of the reach of The New York Times." While the film is full of insights, there may be no scene that more clearly shows the real-time impact of the now-instantaneous news cycle than watching the Times newsroom racing to get out the story “2 White House Officials Helped Give Nunes Intelligence Reports.” It lands just as then-White House Press Secretary Sean Spicer is about to arrive at the podium for a press briefing. Reporters in the press room are seen checking their phones, and then quizzing Spicer on the Times headline — which catches him off-guard. Watching the story unfold on the screen is a rare glimpse into the power and complexity of journalism today. At the same time, the basic tenets of journalism are under attack. It’s simply chilling to watch Trump’s speech during the Conservative Political Action Conference — where Trump says: "We are fighting the fake news” and calls the press “the enemy of the people" — through the eyes of the sleep-deprived, driven, and often frustrated men and women of The Times. "The Fourth Estate," a four-part documentary series, premieres on Showtime May 27. Watch the trailer here. 1 comment about "'New York Times' Reporting At The Speed Of The Internet". Ken Kurtz from creative license, June 18, 2018 at 3:15 p.m.
My grandfather was a reporter at the NYT for four decades. My dad started at the NYT, and spent the next forty years in the print business, ultimately retiring from the Newspaper Advertising Bureau. Yes, the business has changed dramatically, but in no way for the better. The very complexity you allude to in this day and age CREATES fake news, almost forces journalists to become on the spot non-journalists. Ideology rules the day, and there is no place for that in true journalism.